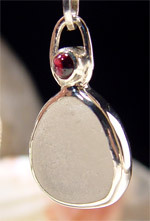 Sea Glass Pendants are truly unique as I band the sea glass stone in band of heavy gauge sterling silver. 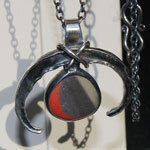 I hammer down the bezel on both sides of the pendant. 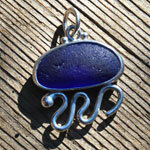 Many are accented with semi precious stones and other gems. 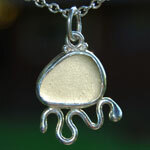 I hand carve, forge, engrave, fuse and use other fabrication techniques to create my sea glass pendants and sea glass jewelry. 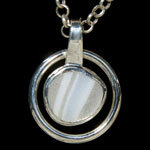 Send your sea glass from YOUR VACATION and have it set in sterling silver. 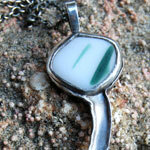 I will custom set your sea glass treasures in hand-fabricated bands of sterling silver. 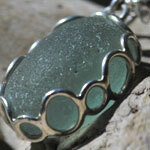 The sterling silver band is hammered down around your sea glass stone securing it forever. 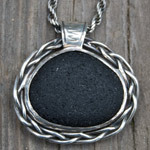 Its polished to a luster creating a keepsake to treasure always.